NASA's Spirit has begun pivoting atop its lander platform on Mars, and the robot's human partners have announced plans to send it toward a crater, then toward some hills, during the mission. Determining exactly where the spacecraft landed, in the context of images taken from orbit, has given planners a useful map of the vicinity. After Spirit drives off its lander and examines nearby soil and rocks, the scientists and engineers managing it from NASA's Jet Propulsion Laboratory, Pasadena, Calif., intend to tell it to head for a crater that is about 250 meters (about 270 yards) northeast of the lander. "We'll be careful as we approach. No one has ever driven up to a martian crater before," said Dr. Steve Squyres of Cornell University, Ithaca, N.Y., principal investigator for the science instruments on Spirit and on its twin Mars Exploration Rover, Opportunity. The impact that dug the crater about 200 meters (about 220 yards)wide probably flung rocks from as deep as 20 to 30 meters (22 to 33 yards) onto the surrounding surface, where Spirit may find them and examine them. "It will provide a window into the subsurface of Mars," Squyres said. East hills, a potential destination. Craters come in all sizes. The main scientific goal for Spirit is to determine whether the Connecticut-sized Gusev Crater ever contained a lake. Taking advantage of the nearby unnamed crater for access to buried deposits will add to what Spirit can learn from surface materials near the lander. After that, if all goes well, the rover will head toward a range of hills about 3 kilometers (2 miles) away for a look at rocks that sit higher than the landing neighborhood's surface. That distance is about five times as far as NASA's mission-success criteria for how far either rover would drive. The highest hills in the group rise about 100 meters (110 yards) above the plain. "I cannot tell you we're going to reach those hills," Squyres said. "We're going to go toward them." Getting closer would improve the detail resolved by Spirit's panoramic camera and by the infrared instrument used for identifying minerals from a distance. First, though, comes drive-off. Overnight Monday to Tuesday, Spirit began rolling. It backed up 25 centimeters (10 inches), turned its wheels and pivoted 45 degrees. "The engineering team is just elated that we're driving," said JPL's Chris Lewicki, flight director. "We've cut loose our ties and we're ready to rove." After two more pivots, for a total clockwise turn of 115 degrees, Spirit will be ready for driving onto the martian surface very early Thursday morning, according to latest plans. 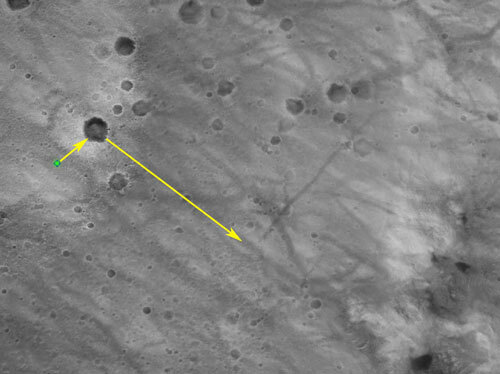 Engineers and scientists have determined where on the martian surface the lander came to rest. NASA's Mars Odyssey orbiter was used in a technique similar to satellite-based global positioning systems on Earth to estimate the location of the landing site, said JPL's Joe Guinn of the rover mission's navigation team. Other researchers correlated features seen on the horizon in Spirit's panoramic views with hills and craters identifiable in images taken by Mars Global Surveyor and Odyssey. "We've got a tremendous vista here with all kinds of features on the horizon," said JPL's Dr. Tim Parker, landing site-mapping geologist. The spacecraft came to rest only about 250 to 300 meters (270 to 330 yards) southeast of its first impact. Transverse rockets successful slowed horizontal motion seconds before impact, said JPL's Rob Manning, who headed development of the entry, descent and landing system. The spacecraft, encased in airbags, was just 8.5 meters (27.9 feet) off the ground when its bridle was cut for the final freefall to the surface. It first bounced about 8.4 meters (27.6 feet) high, then bounced 27 more times before stopping. Analysis of Spirit's landing may aid in minor adjustments for Opportunity, on track for landing on the opposite side of Mars on Jan. 25 (Universal Time and EST; 9:05 p.m. Jan. 24, PST). JPL, a division of the California Institute of Technology in Pasadena, manages the Mars Exploration Rover project for NASA's Office of Space Science, Washington. For more information about NASA and the Mars mission on the Internet, visit http://www.nasa.gov. Additional information about the rover project is available from NASA's JPL at http://marsrovers.jpl.nasa.gov and from Cornell University at http://athena.cornell.edu.